The liquor industry - including companies Distell, Heineken, Diageo, Pernod Ricard, SALBA and Vinpro - has signed the Guidelines for Good Business Practice for South African Companies Operating on the African Continent. Minister Rob Davies, and chairperson of Industry Association for Alcohol Responsibility and Education, Rico Basson, with representatives of Distell, Heineken, Diageo, Pernod Ricard, SALBA and Vinpro. The signing ceremony, which took place in Cape Town this week, was witnessed by the Minister of Trade and Industry, Dr Rob Davies, and the Chairperson of the Portfolio Committee on Trade and Industry, Joanmariae Louise Fubbs. 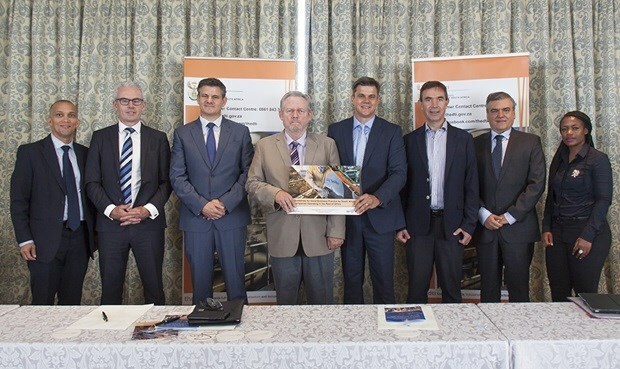 Minister Davies said the guidelines aim to encourage companies to align their involvement and practices with the South African government’s integration and development objectives in the continent and build mutual confidence, trust and benefit for the companies and the societies in which they operate. Davies added that the signing ceremony confirmed the importance attached by both government and the liquor industry to support the development integration efforts of the continent, as well as to improve the quality of South Africa’s presence and reputation on the continent. “In line with South Africa’s and the continent’s developmental integration ambitions, the Guidelines represent a proactive initiative by government to promote responsible business conduct and good corporate governance by the South African private sector in their business engagements in the continent. They are a voluntary set of principles and standards that seek to ensure that the operations of various South African businesses abroad are in compliance with the laws of the countries in which they operate; as well as aligned with and in support of government policies and the developmental approach to regional economic integration in the African continent,” Davies said. He highlighted that the Guidelines do not place any additional bureaucratic or legal obligations for companies. However, they aim to ensure that alignment is created between government and the private sector in our engagements with the continent, particularly in advancing Africa’s developmental agenda. The Chairperson of Industry Association for Alcohol Responsibility and Education, Rico Basson said the signing represents the alcohol industry’s commitment towards a better future for South African and communities which they operate in. “Signing the Guidelines for Good Business Practice binds the liquor industry to a set of principles and standards that will ensure business conducted across Africa will comply with the laws of the countries in which they operate,” said Basson. “We are committed to investing in infrastructure and boosting the local economy in the countries we operate in, and in doing so, want to ensure that we are giving back to communities. We aim to replenish natural resources of the land and empower communities through skills development while conscious of our employees' well-being and work environments,” concluded Basson. About 60 companies have signed the Guidelines to date.